This project provides a descriptive profile of ambulatory care provided by safety net clinics in Los Angeles County before and after California’s implementation of the Affordable Care Act (ACA). This project measures change in service volume and patients before and after the ACA, and measures the relative contribution of safety net clinics’ service volume toward an estimated total of all service volume attributable to low-income residents. Results are shown at the level of Los Angeles County Service Planning Areas (SPAs), and, where applicable, at the clinic level. This report includes CCALAC member clinics and non-member clinics. CCALAC clinics are defined as Federally-Qualified Health Centers and Look-A-Like entities (FQHCs), Data is presented by organization entity and service location within each SPA. The CCALAC membership consists of 47 Community Clinics and Health Centers with 232 full-time and part-time sites. Operating hours range from as low as six hours per month up to 24 hours per day. Some sites are operated in partnership with another entity outside the CCALAC membership. Sixty-eight percent of clinic sites listed in the OSHPD Primary Care Clinic Database within LA are CCALAC Members. Of the membership, 29 clinic organizations are 330-funded FQHCs, nine are FQHC look-alikes and nine are neither FQHCs nor FQHC look-alikes. Total service volume attributable to low-income residents has been estimated by using population estimates by SPA combined with ambulatory use rates derived from the National Ambulatory Medical Care Survey. Community level data is derived from the California Health Interview Survey, LA Health Survey, and the American Communities Survey. View CCALAC’s 2018 Network Adequacy Report here. This project was funded by L.A. Care Health Plan to benefit low-income and uninsured residents of Los Angeles County. Socio-economic and environmental factors play a significant role in a person’s ability to achieve health and wellness. The following section highlights the social determinants of health impacting Angelenos. 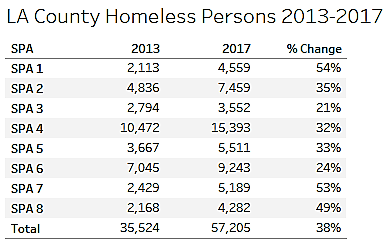 Data from the annual counts of homeless persons in the County shows a 37.9% increase from 2013 to 2017 from 35,524 to 57,205, respectively. The number of community clinic patients that lived below 100% federal poverty level increased in SPAs 1, 3, 5, and 7. Through a variety of measures of health, Los Angeles County and the SPAs have wide variation in health indicators. Many of the indicators are directly impacted by economic and social conditions, and can be mitigated by access to health care. With the exception of a few SPAs, most areas are impacted by high poverty rates, high rates low educational attainment, and high rates of the population who spend more than 30% of income for housing. These indicators show there are significant proportions of the County’s populations that are living in extreme economic hardship. These are key findings from CCALAC’s 2018 Network Adequacy Report. There were promising findings in dental care utilization reflecting quality-focused initiatives of the clinics. The following section highlights expansions in dental services and remaining access challenges. The number of dental visits provided by community clinics has increased by 29% from 2012-2015. This increase occurred in all but one SPA. The number of full time dentists employed by Health Centers also increased dramatically. Despite the enhanced role of community clinics in providing dental care, nearly two-fifths of adult residents report not seeing a dentist or going to a dental clinic within the past year, and in SPA 6 this proportion was 56%. SPA 7 also had a high proportion of adults not accessing dental care at 46.9%. For children ages 0-17, roughly 1 in 10 did not access dental care in the last year due to financial reasons. 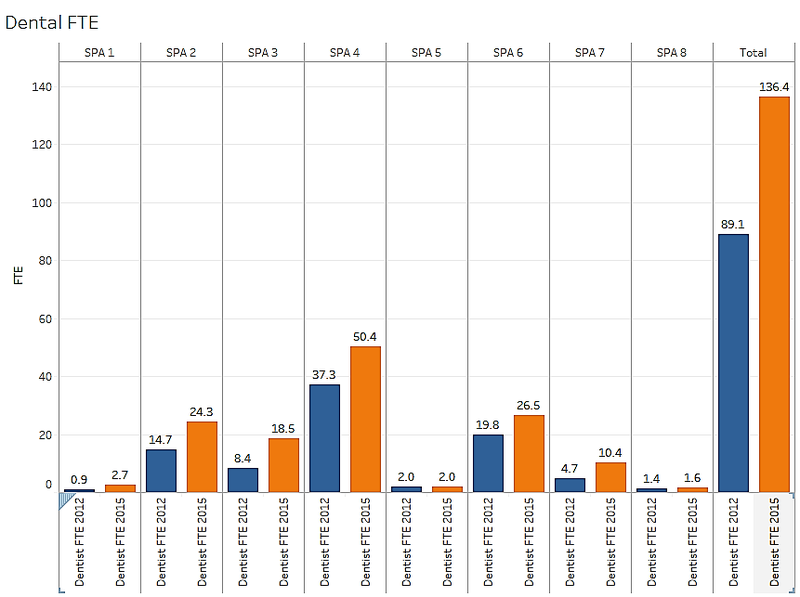 This proportion was highest in SPAs 1 and 6 at 14.2% and 15.5%, respectively. LA’s clinics are paving the way for integrative care by providing a host of behavioral health services at their sites. 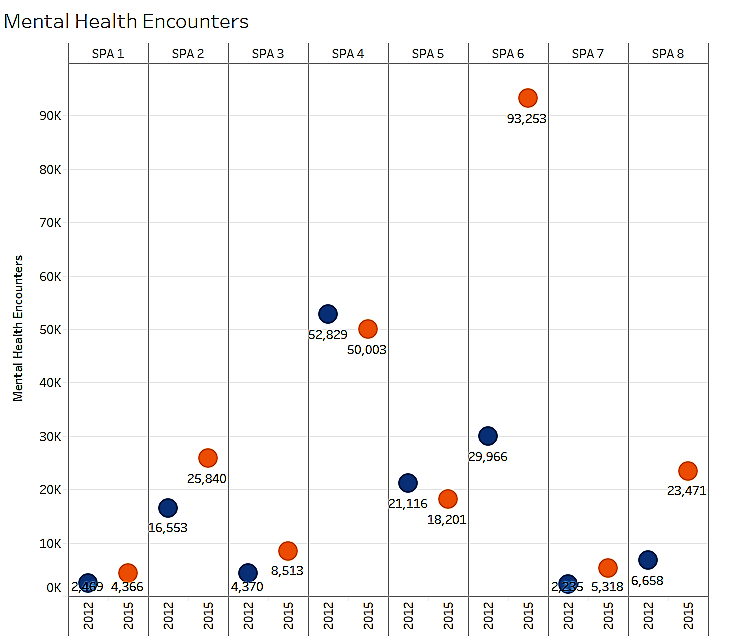 The following section highlights expansions in mental health services provided by clinics. The number of mental health visits provided by community clinics has increased by 68% from 2012-2015. 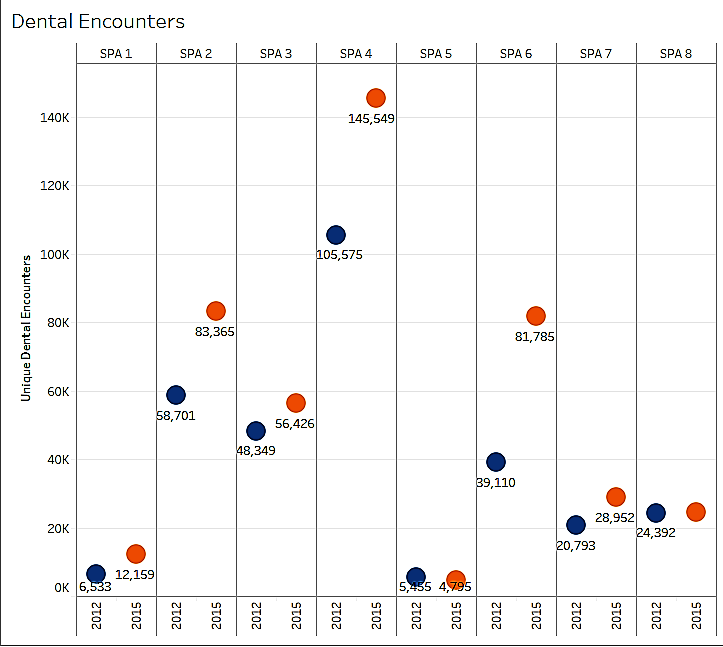 This increase occurred in 6 of the 8 SPAs, with the most dramatic gains occurring in SPA 6. Overall, clinics also increased capacity to provide mental health services, given the boost in the number of mental health providers (psychiatrists, clinical psychologists, and licensed social workers). Los Angeles community clinics and health centers play a key role in offering comprehensive health care for those in need, and are an important source of primary care for Medi-Cal and uninsured patients. The following section outlines key findings in the areas of health coverage for Angelenos, the role of clinics in serving the newly insured, and remaining access challenges. The total number of patients served increased in all service provider areas regardless of payer status, with the exception of one (SPA 4). Overall, as expected, the rates of the uninsured declined and health coverage increased primarily via Medi-Cal. Similarly, the profile of patients in safety net clinics shifted from uninsured to Medi-Cal, and as shown in this report, safety net clinics continue to provide the bulk of care to uninsured persons and Medi-Cal beneficiaries in the County. 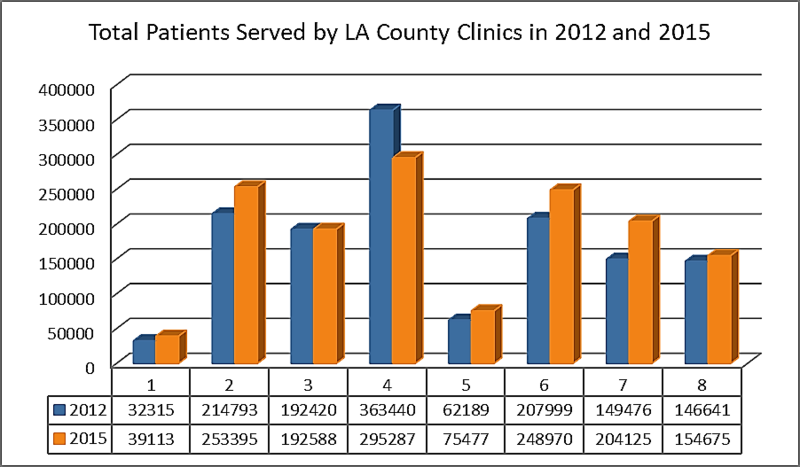 Community clinics provide nearly 44% of all Medi-Cal volume, and 41% of uninsured volume in the County. Moreover, in some of the eight Service Planning Areas (SPAs) of the County, safety net clinics provide 70% of the Medi-Cal and/or uninsured. As expected with the expansion of Medi-Cal volume under the Affordable Care Act, the percentage of the population without insurance coverage decreased across LA County. Over half a million residents obtained some form of health insurance coverage. Employment-based coverage and Medicare/Other Public insurance coverage also decreased overall in the county between 2012 to 2015. Across this period, the uninsured rate dropped from 23% to 14%, or from 1.58 million in 2012 to 1.04 million in 2015. 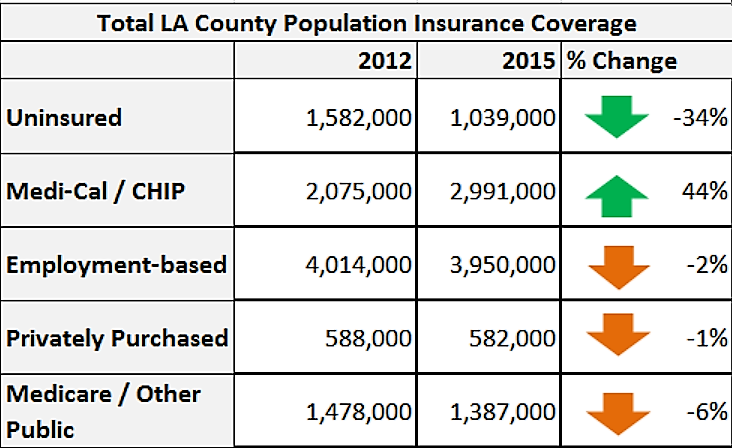 The period shows a corresponding increase in the population covered under Medi-Cal or CHIP 16% (2.07 million) to 30% (2.99 million). From 2012 to 2015, the share of safety net clinics’ service contribution in serving the County’s Medi-Cal population increased from 29% to 44%. Significantly, safety net clinics in five SPAs contribute more than 48% of all ambulatory care provided to the Medi-Cal population, and in two SPAs more than an estimated 50% contribution in care to the uninsured. 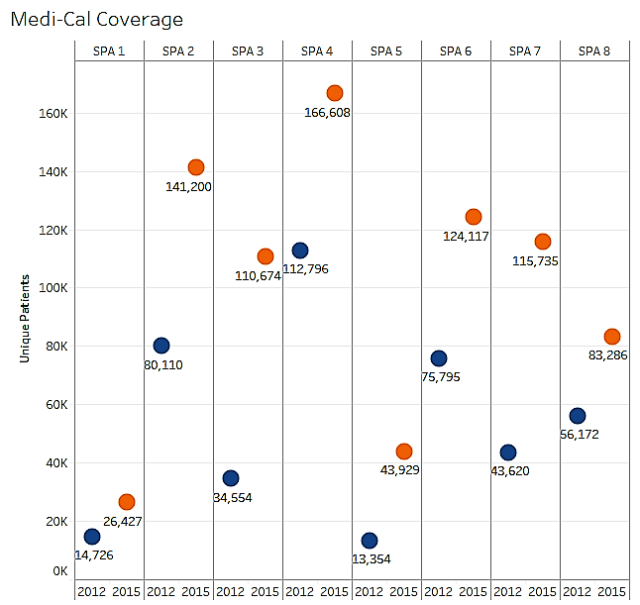 The number of LA County clinic patients covered by Medi-Cal Managed Care plans more than doubled between 2012 and 2015. 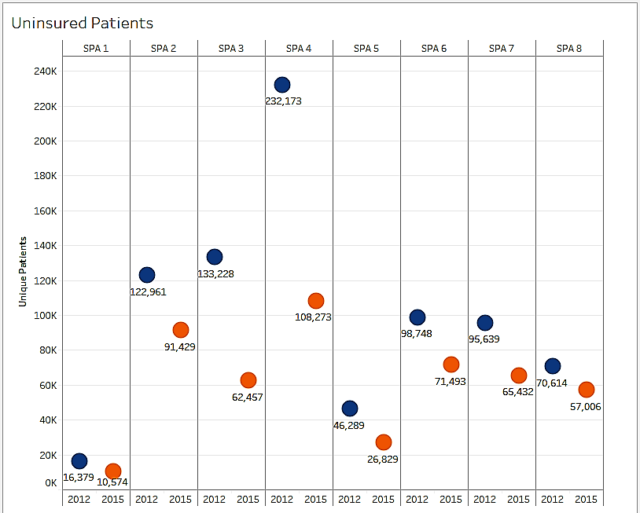 (p. 22) In 2015, according to OSHPD data, at least 50% of the community clinic payer mix in every SPA was made up of Medi-Cal and Medi-Cal managed care. Despite gains in coverage, challenges in accessing care persist, despite the fact that the uninsured rates have decreased significantly in each SPA.